Midcoast Energy is a full-service natural gas and natural gas liquid (NGL) midstream business headquartered in Houston, Texas. Safety, operational reliability and system integrity are at the core of what we do. This segment involves our three systems – Anadarko, East Texas and North Texas – for gathering, treating, processing and transporting natural gas and NGLs. They connect established and growing gas-producing regions in Texas and Oklahoma. 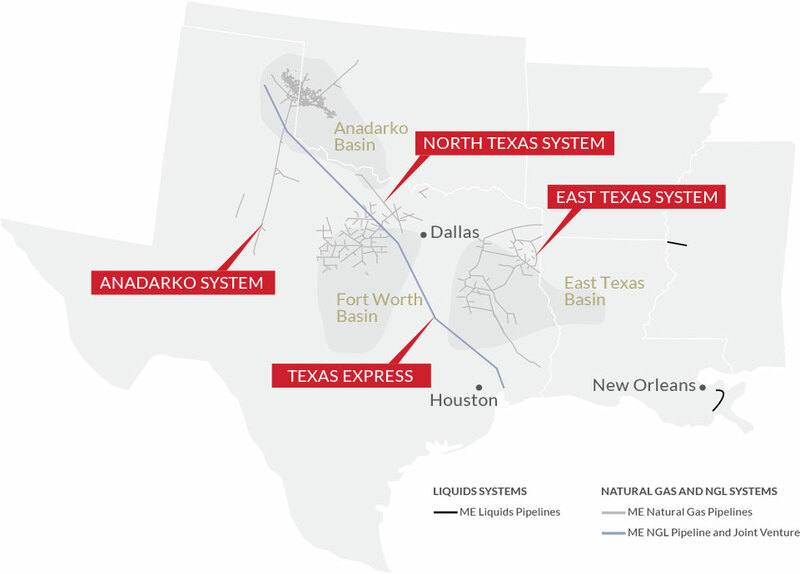 Our Texas Express NGL System provides takeaway from liquid rich basins in the Rockies, the mid-continent and Texas. MLTM, L.P. is a transportation, logistics and marketing subsidiary of Midcoast Energy – dedicated to providing high quality services in the safest, most reliable way. We purchase, sell, transport, process and store natural gas liquids as well as condensate, crude oil and other petroleum products to customers, distributors and industrials throughout the United States. MLTM also offers purity products and an array of propane supply programs, including terminal pricing, delivered pricing and pre-buys, at the Conway and Mont Belvieu trading hubs. Please call 811 to ensure your project is completed properly and safely.